The year of 2017 was extremely productive: the editors changed their looks and gain more formatting power, the collaborative platform became secure and easier to integrate with your IT infrastructure. We also launched a new solution and formed some new amazing alliances. Want to know more? This year we changed the whole appearance of our editors when in v5.0 we transferred them to a new interface. All the tools are now grouped into tabs for easier navigation. It’s a very elegant way to organize space for new features which we are constantly adding! And yeah, this year we introduced a lot of amazing features, such as footnotes in the text processor, pivot tables and 154 new formulas in online spreadsheets, and presenter view in presentations. Several exciting features will appear in nearest future. Just wait for it! We also were working hard on our plugin system. It allows developers to add the functionality they need to the editors using our API. And by developers we mean not only ourselves, so the documentation was significantly expanded and improved! Also, now the plugins took their rightful place in the new interface. By the way, can you believe that ONLYOFFICE editors are five years old? Cause we cannot! They all grow so fast, right? But with everything we accomplished this year, with every feature added and every bug fixed, we no longer feel like a market novice. Our office suite became mature and we are concentrating on professional features now. We launched a new solution this year! It all started with just one comment in the ownCloud community saying that ONLYOFFICE editors and ownCloud were a match made in heaven. We’ve developed an integration app to connect our editors to ownCloud and everything went great. We also got asked whether our app was compatible with Nextcloud. To tell the truth, it wasn’t, but we were ready to work, ’cause the need for editors compatible with docx, xlsx and pptx was obvious. Now you can use our editors within ownCloud, Nextcloud, SharePoint, Confluence and Alfresco. And we can’t promise it’s the final version of the list! ONLYOFFICE is not only document editors, it’s a solid collaborative platform. We focused on on-premise solution following the chosen direction – security and more close integration with existing customer infrastructure. For example, we significantly improved LDAP/SAML and SSO (in addition to OneLogin, it’s now possible to use Shibboleth and AD FS). More integrations for effective collaboration. We continued working with our German friends and partners from PowerFolder, and this year the number of our users grew significantly. Integrated within the PowerFolder Sync&Share solution, ONLYOFFICE editors are now being used by the leading German technological institute – the Karlsruhe Institute of Technology (KIT) and all students and employees of the higher education institutions across the German state Baden-Württemberg as well as of the University of Rostock. Another great partnership is one we have with Univention, a German IT infrastructure provider. In September the open source version of the ONLYOFFICE editing suite was added to Univention App Center so that the Univention users can install it together with ownCloud/Nextcloud. The start was successful – ONLYOFFICE quickly hit the top 10 of the third-party apps, replacing Collabora (haven’t you, incidentally, read our ONLYOFFICE vs Collabora article?). By the way, if you use ONLYOFFICE in Univention environment and want to talk to us in person, meet us at Univention Summit 2018 in February! See, the year was great, and the next one will be. 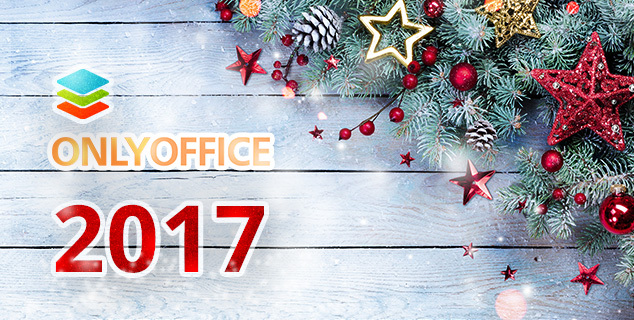 Happy holidays to all of you and thanks for choosing ONLYOFFICE!